Weed suppression can occur when two or more crops are considered “main crops,” although not as consistently as with smother crops. The ability of this type of intercrop to suppress weeds depends largely on the combination of crops grown together and the plant density. Crops with differing growth habits and resource use patterns often make good intercropping combinations, as the crops make good use of available resources without competing with each other. However, for weed suppression, the overall competitive ability of the intercrop is important as well. The competitive ability of a grain intercrop tends to be somewhere in between that of the most and the least competitive crop in the mix. For example, Mohler and Liebman (1987; in Liebman and Dyck, 1993) found that a barley-pea intercrop had fewer weeds than pea grown as a sole crop, but more weeds than barley grown as a sole crop. Therefore, intercropping can be an effective way of suppressing weeds when growing crops that are poor competitors. This practice can be especially useful in organic production, where herbicides are not an option. A greenhouse experiment was conducted to compare the yield and weed suppression ability of sole crops and intercrop mixtures of up to ten crops. Wild oat biomass was significantly lower in the intercrops than in the sole crops. As the number of crops in the mix increased, wild oat biomass continued to decrease. The most likely cause of this weed suppression was that the intercrops captured more light than the sole crops, due to the different growth habits and heights of the intercrops (Szumalgaski, 2005). In a related field experiment in Manitoba, wheat, canola and pea were grown as sole crops and in all possible combinations (see NSA article), including a three-way intercrop. In general, weed biomass was lower in the intercrops than in the sole crops and tended to be lowest in the wheat-canola-pea combination, although results varied somewhat with year and location. Of the two-crop combinations, wheat-canola and canola-pea gave the best weed suppression. Wheat-pea had more weed growth than pea grown alone, but less than canola or wheat grown alone (Figure 1; Szumalgaski, 2005). 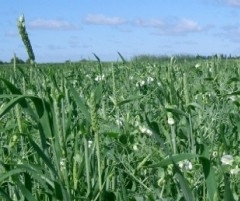 Read more at Agronomic Benefits of Intercropping Annual Crops in Manitoba. Fig. 1. Mean weed biomass in cropping systems at Carman and Kelburn from 2001 to 2003. Similarly, in North Dakota, intercropping wheat with lentil reduced weed biomass by 96% in one year and 68% in another year, compared to sole-cropped lentil (Carr et al., 1995). Another Manitoba study compared various intercropping systems under organic management with wheat as a main crop. Crop combinations included cereal intercrops (wheat with oats, barley, or rye), other grain intercrops (wheat with flax, field pea, or oriental mustard), and cover crops (wheat with hairy vetch, red clover, or annual ryegrass). In this study, intercrop combinations that provided the most weed suppression were those that grew vigorously and covered the ground quickly in spring (Pridham, 2006). The most competitive combinations tended to be the cereal intercrops including barley or oat. The least competitive combinations were those including a crop that was slow to establish in the spring, such as hairy vetch and oriental mustard. In this study, intercropping removed some of the risk from growing uncompetitive crops such as oriental mustard and field pea. Read more at Cultivar Mixtures, Cover Crops, and Intercropping with Organic Spring Wheat. Increasing the plant density of sole crops often allows the crop to compete better with weeds, and it follows that increasing the density of intercrops would have the same effect. In fact, this effect is probably more pronounced in intercropping systems than in sole cropping systems; land equivalency ratios (LERs) tend to rise when intercrops are seeded at higher densities (Liebman and Dyck, 1993). The reason for this is that two crops grown as an intercrop can be seeded at close to their sole crop seeding rates, resulting in a much higher total plant density than in a sole crop. While such a high plant density in a sole crop would only cause competition between plants of the same species, the different resource use patterns of crops in intercropping systems allow for a higher total plant density without creating competition between crop plants. Intercropping grain crops can result in better resource utilization and there a certain degree of weed suppression. Growing a non-competitive crop such as field pea or lentil together with a more competitive crop can take some risk out of growing non-competitive crops without herbicides. Carr, P.M., J.C. Gardner, B.G. Schatz, S.W. Zwinger and S.J. Guldan. 1995. Grain yield and weed biomass of a wheat-lentil intercrop. Agron. J. 87:574-579. Szumalgaski, A.R. 2005. Studies on the functionality of annual crop and weed diversity in polyculture cropping systems. Ph.D. thesis. University of Manitoba, Winnipeg, MB.